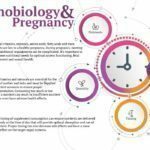 The principles of chronobiology can help you attain the best nutrition possible, as this is a very important goal during pregnancy. Even in a normal state, the human body requires a very wide range of nutrients. Scientists believe that the essential nutrients include 18 vitamins, at least 6 minerals, 21 amino acids and 3 fatty acids—plus dozens of essential trace elements. Human nutritional requirements can be complicated and it’s important to meet these requirements for optimal functioning and health. However, nutrient needs become even more complex and even more important during pregnancy. Growing a new human being requires a lot of changes within the mother’s body. To facilitate these many changes, an expecting mother should adjust her nutrient intake according to her body’s changing needs. A woman’s recommended daily intake for most nutrients will rise during pregnancy and some of these nutrients are more important than others. To give a concrete example, some of the most important nutrients during pregnancy include iron, calcium and folic acid. These nutrients must be taken in much larger amounts than before. Extra iron is needed during pregnancy because this element works together with potassium, sodium and water to ensure that the growing baby receives enough oxygen. Not getting enough iron during pregnancy increases the risk of fatigue, infection, low birth weight, premature delivery and poor infant brain development. Pregnant women should take more calcium than normal because not getting enough of it could cause the mineral to be leached from her own bones in order to provide for the baby’s bones. Plenty of calcium can also help prevent prenatal high blood pressure. Finally, it’s crucial to take a supplement with folic acid while pregnant because doing so greatly reduces the risk of neural tube defects, which are major birth defects that affect the brain and spinal cord. Folic acid also decreases the risk of premature delivery. Where Does Chronobiology Fit In? 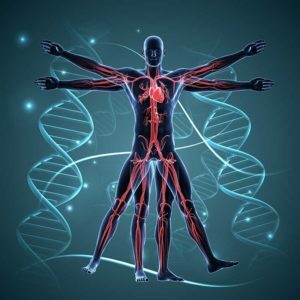 Chronobiology is the science of cyclic phenomena, natural cycles, processes and systems in the body, in living organisms. Examples of such cyclic phenomena include the 24-hour circadian rhythm that regulates sleep or the 28-day female menstrual cycle. One important observation in the field of chronobiology is that the human body best utilizes certain nutrients at particular times of the day. During pregnancy, proper nutrition is more important than ever. Select vitamins and minerals as well as specific proteins are essential for the health of mother and baby and must be supplied in sufficient amounts. Most of the necessary vitamins, minerals and nutrients can be found in many different formulas on the market today. However, the latest research has shown that not only is it necessary to get the right amount of each nutrient, but the particular time of day each vitamin and mineral is made available to your system is also extremely important. You can help your baby get all the nutrients it needs by using a chronobiologically designed prenatal supplement. These supplements deliver nutrients to the body at the time of day that will provide optimal absorption and use of the nutrient. Taking particular nutrients at the right time of day is important because some nutrients are better utilized by the body during sleep and some provide energy for your day. For example, folic acid is used to make DNA, to create new cells and to repair existing cells. Because these biological functions largely take place during sleep, it’s best to take folic acid before bed rather than in the morning. On the other hand, one nutrient that may be best taken in the morning is vitamin D. Because vitamin D is important to the immune system and most immune threats that your body faces occur during the daytime, taking vitamin D in the morning can help this nutrient be as potent as possible. Occasionally, some nutrients interfere with the absorption or the body’s use of another ingredient. For example, vitamin C can keep the body from using copper to its fullest potential. Nutrient pairs like vitamin C and copper are best taken separately at different times of the day. This complicated set of rules which is governed by our internal clocks determines the time certain substances are most effective and is the groundwork for chronobiology studies. The insights offered by chronobiology reveal that time of day and the intake of substances is crucial to optimal benefits and effects. The increased demand for essential substances during pregnancy and the nursing period should be met in the form of an optimized nutritional supplement. During this time, more than three dozen minerals, trace elements, vitamins and fatty acids play an important role. A chronobiologically-aligned formulation provides mother and child with all vital vitamins, minerals and trace elements during the optimum time of day, thus preventing developmental disturbances and harmful deficiencies. A dietary supplement developed in accordance with the rules of chronobiology supplies the body with a sufficient amount of the proper vitamins and minerals in the morning as well as all those that are essential for the. As a result of proper supplementation and timing, a number of complications during pregnancy can be prevented, the risk of preterm birth is reduced, and the baby is in overall better health at birth. Moreover, there is a lower risk of birth defects. The key is to ensure optimum supplementation with the most important growth substances from day one so that mother and child receive an ideal supply throughout the entire pregnancy and nursing period. 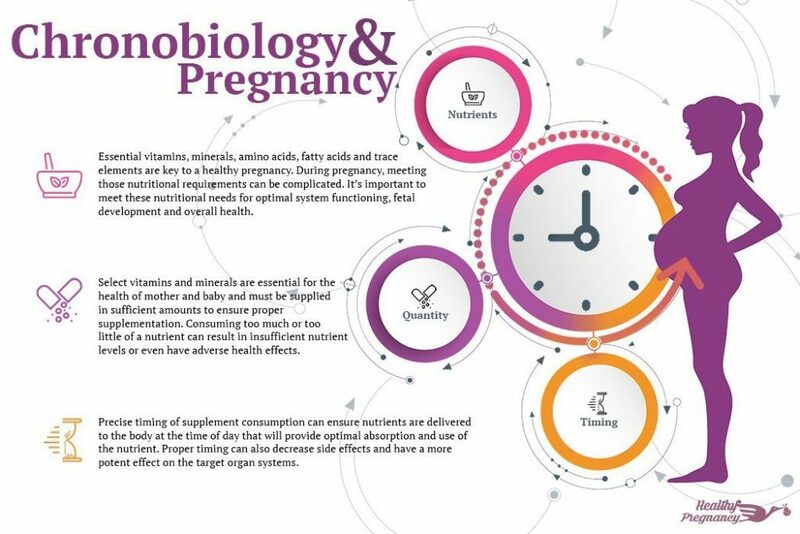 A chronobiological dietary supplement can ensure that you don’t consume such nutrient pairs, ensuring that your baby experiences optimal growth and health.